If you're an uncouth lout like me, figuring out how to handle standard cutlery is enough of a challenge. But chopsticks? You might as well be speaking Chinese. Get it? Because they're chopsticks. Regardless, even if you've got the manual dexterity to pick up everything from dragon rolls to glass noodles with chopsticks, one question always turns up: where the hell do you put them when you have to set them down? They easily fall into or off of your plate if you try resting them on the edge, and putting them on the table gets grease and sauce everywhere. Unless you get a little holder, where to put them gets confusing. Well, in fact, there's a simple solve. And this Instagram post by browncardigan shows how every cheap pair of takeout chopsticks has a built-in holder. That's it. 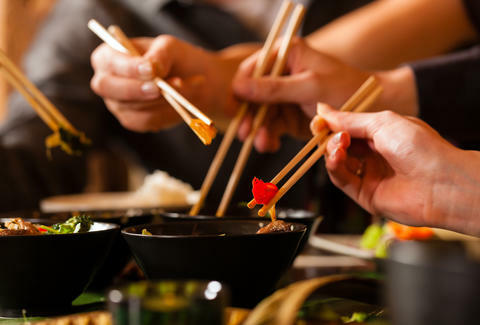 All you have to do is break your chopsticks perpendicular to where they're split -- not continuing the split to separate the two sides. Then, voila! You've got a readymade chopstick holder. This trick won't make you look cooler if you can't pick up your wasabi. But if you're semi-competent with the sticks, now you've got a party trick that'll wow your fellow diners. And who doesn't like party tricks? Ryan Craggs is Thrillist's Senior News Editor. He's pretty handy with chopsticks, though he still hasn't mastered how to eat rice with them. Follow him @ryanrcraggs.